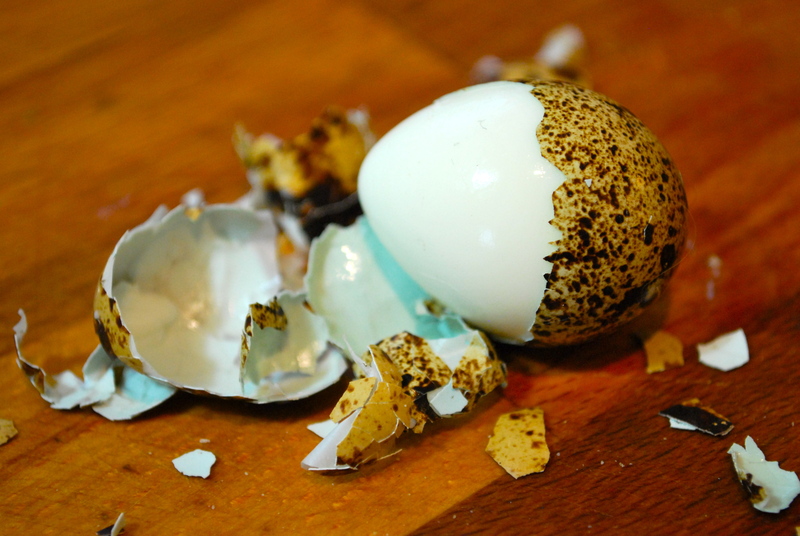 Anybody who has ever tried peeling a hard-boiled quail egg knows that it’s a tedious chore, at best. Anybody who raises their own quail knows that fresh quail eggs are next to impossible to peel cleanly. The solution? Never boil another quail egg. Steam them. Simply use a vegetable steamer in a pot with about an inch of water and a tight fitting lid. Turn the heat up to maximum and when the steam starts coming, set a timer for six minutes. After that, rinse your eggs well in cold water and let them sit in the water for a few minutes. This egg is so fresh it was actually laid today, not bad huh? Then peel. Quail eggs have a thin shell and a thick membrane, so pinch through the membrane at the fat end of the egg, where there is an air pocket, to make sure you get a clean removal. Of course, this method also works for fresh chicken eggs. Steam them for about 12-15 minutes. You’ll be amazed! This entry was posted in chickens, cooking, quail and tagged eggs hard to peel, hard steaming eggs, peeling fresh boiled eggs. Bookmark the permalink.